Comanche Warbirds’ P-51B Mustang Berlin Express has departed its base in the USA and is currently undertaking a mammoth 5,470 mile journey across the North Atlantic to star at Duxford’s prestigious Flying Legends airshow. Final preparations were made in the days leading up to this epic voyage. A successful warm-up flight in Ed Shipley’s hands saw the Mustang travel from Stallion 51 in Florida to the Comanche Warbirds ranch in Texas. More test flights have been conducted to check that the underwing drop tanks (which will be utilised on the long legs of the transatlantic flight) are correctly functioning, and the support team have conducted thorough inspections of the aeroplane. 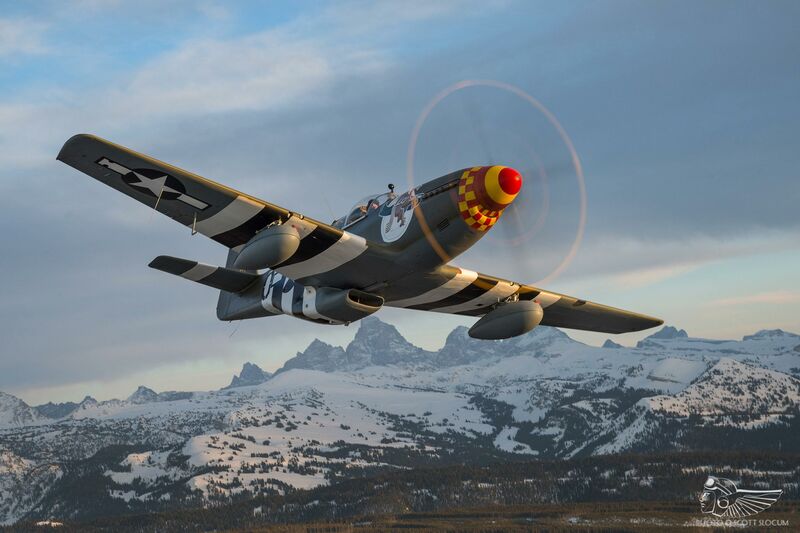 This P-51B was restored by Pacific Fighters to award-winning standards, and the aeroplane had the distinction of receiving the EAA Oshkosh ‘Most Authentic’ and ‘Golden Wrench’ awards. The quality of work from the Muszala workshop is renowned amongst the historic aviation fraternity – there is little doubt that this ship is prime for the long crossing ahead. This restoration was based around the remains of P-51B 43-24837. Flying from RAF Staplehurst in Kent with the 363rd Fighter Group, the Mustang crashed in Beckley on 10 June 1944 after its pilot was forced to bail out during a training exercise. The decision was made to paint the restored aircraft in the 357th Fighter Group scheme of Bill Overstreet’s Berlin Express. Both pilot and Mustang are famous for reputedly flying under the Eiffel Tower whilst in hot pursuit of a Messerschmitt Bf-109 during a dogfight over Paris, eventually downing the enemy aircraft and evading ground fire to return to base at Leiston in Suffolk. In the hotseat for the 5,470 mile journey is one of the most experienced Mustang pilots in the world today – Lee Lauderback. His expertise and vast experience in both corporate and private aviation earned him the distinction of becoming an FAA Experimental Aircraft Examiner. Lee is a member of the Society of Test Pilots (SETP) and is often called upon to flight test various vintage aeroplanes, helicopters and turbojets. Lee is also owner and Chief Pilot of the Stallion 51 Corporation, the organisation responsible for providing instruction to thousands of pilots on the correct and safe methods of flying the P-51 Mustang for over 30 years. He also performs his stunning aerobatic Mustang routine at airshows in North America, and was among the first civilian Heritage Flight pilots. Lee’s log book contains in excess of 21,000 flying hours, of which over 9,000 of these have been spent at the helm of a Mustang. 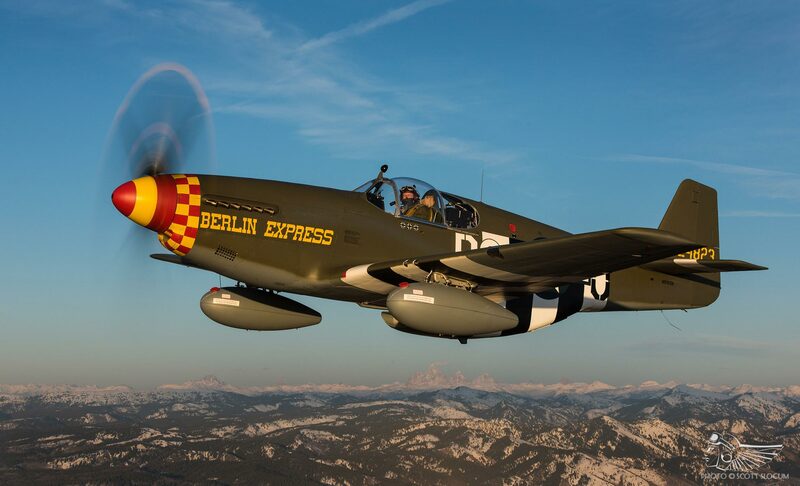 Lee commented on their undertaking, “What an honor to fly ‘Berlin Express’ to Duxford to pay tribute to the men and women who helped make the P-51 Mustang such an iconic fighter! I am such a small part of a special team of people that make such an adventure a reality!”. Berlin Express will be in safe hands. As I write this, Lee and his support aircraft (a King Air) have just cruised into New York state airspace short of arriving in Dunkirk, NY on the second leg of their journey having departed Texas on 28 June. From here, they will leapfrog to Bangor, Maine and Goose Bay, Canada where they will be following in the footsteps of their forebears in P-38 Lightning fighters on the historic North Atlantic air ferry route used in 1942 as part of Operation Bolero, the codename given to the United States military troop build-up in the UK during the Second World War. As fighters carried only a single crew member and lacked the proper navigation equipment to undertake such a route, groups of fighters were paired with a heavy type such as B-17, B-24 or C-47 and led across. With no modern chase planes, safety aids and rescue services, this was a high risk undertaking by these young men who were, more often than not, combat crews rather than dedicated ferry pilots. 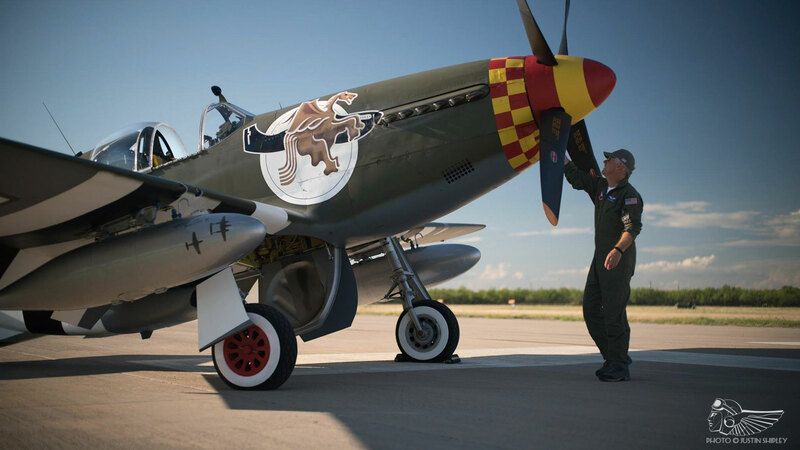 The arrival of Berlin Express in the UK will signify the first time a high-back Malcolm Hood Mustang has been seen in European skies since wartime, and the surprise announcement that the Mustang will participate in the Flying Legends airshow has caused quite a buzz amongst historic aviation enthusiasts. Once at Duxford it will join its Comanche Warbirds stablemate and fellow 357th Fighter Group marked Mustang, P-51D Frenesi (which has been shipped over and is being reassembled) to star as one of the centrepieces in the 25th edition of The Fighter Collection’s world-renowned Flying Legends airshow. 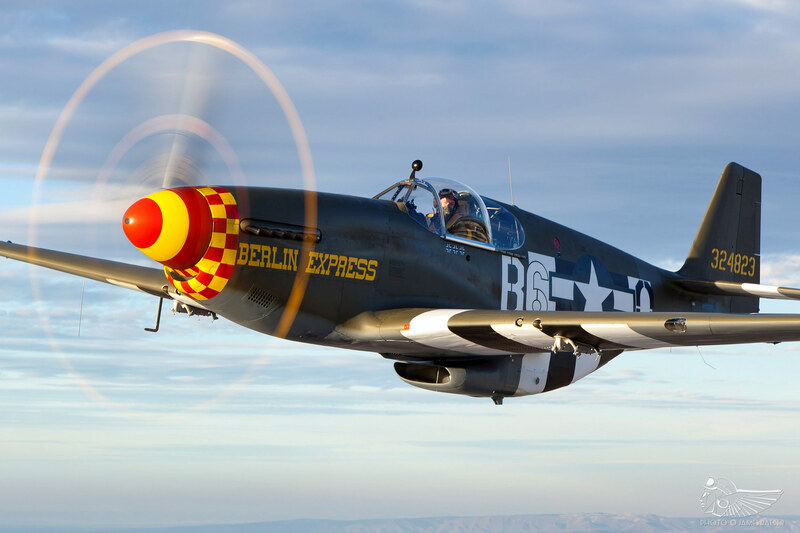 Owner Dan Friedkin will fly Berlin Express on the left wing of the Horsemen formation alongside Steve Hinton and Ed Shipley as they perform their lyrical and exquisite formation aerobatics. The trio of Mustangs in the sky over East Anglia will evoke the history of 70 years prior, when the area was dotted with US airbases and the local communities overrun with the ‘Friendly Invasion’ of American servicemen. Many of these men served with the ‘Mighty’ 8th Air Force, of which over 26,000 made the ultimate sacrifice and never returned home. As the founder of The Air Force Heritage Flight Foundation, Dan is one of just nine civilian pilots qualified to fly in formation with the U.S. Air Force’s single-ship demonstration teams. The week after Flying Legends this symbolic meeting of old and new will take centre stage at the Royal International Air Tattoo at RAF Fairford, when Dan will pilot Berlin Express alongside the Air Combat Command’s F-22 aerial demonstration team in an impressive display. The displays that Berlin Express will perform in British skies will echo the past, representing the machines used in combat 70 years ago whilst honouring the brave young men who mounted them to fight against tyranny and oppression, especially those who laid down their lives in sacrifice – that is the very soul of the present day warbird scene. That there are still people who dedicate so much time, effort and expertise to such ventures decades after these aeroplanes fought in combat is genuinley wonderful. This P-51B’s visit to the UK will be a must-see for all warbird enthusiasts, and a highlight of the 2017 airshow season. The Mustang is anticipated to arrive at Duxford on Tuesday 4 July and real time progress can be tracked on the Pursuit Aviation website, with many more photographs posted regularly on their Instagram page, @persuit.aviation – the warbird world will be watching intently!  The Flying Legends airshow is a ticket-only event so don’t forget to purchase your tickets in advance! With thanks to Stallion 51 Flight Academy, Scott Slocum, Justin Shipley and James Raeder.